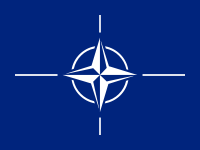 The North Atlantic Treaty Organisation (NATO; French: Organisation du Traité de l'Atlantique Nord ("OTAN"); also called the North Atlantic Alliance, the Atlantic Alliance, or the Western Alliance) is a military alliance established by the signing of the North Atlantic Treaty on April 4, 1949. With headquarters in Brussels, Belgium, the organisation establishes a system of collective security whereby its member states agree to mutual defense in response to an attack by any external party. These talks resulted in the North Atlantic Treaty, created by Lester B. Pearson, which was signed in Washington, DC on 4 April 1949. It included the five Treaty of Brussels states, as well as the United States, Canada, Portugal, Italy, Norway, Denmark and Iceland. Three years later, on 18 February 1952, Greece and Turkey also joined. Because of geography, Australia and New Zealand missed out on membership. In place of this, the ANZUS agreement was made by the United States with these nations. In 1954 the Soviet Union suggested that it should join NATO to preserve peace in Europe. The NATO countries rejected this, seeing it as an attempt to subvert NATO from within. The unity of NATO was breached early on in its history, with a crisis occurring during Charles de Gaulle's presidency of France from 1958 onward. De Gaulle protested the United States' hegemonical role in the organisation and protested what he perceived as a special relationship between the United States and the United Kingdom. In a memorandum he sent on 17 September 1958 to President Eisenhower and Prime Minister Harold Macmillan, he argued for the creation of a tripartite directorate that would put France on an equal footing with the United States and the United Kingdom, and also for the expansion of NATO's coverage to include geographical areas of interest to France. Considering the response he was given to be unsatisfactory, de Gaulle started pursuing an independent defence for his country. France withdrew its Mediterranean fleet from NATO command on March 11, 1959, and pursued an independent nuclear program, theorizing the " Force de frappe" (Striking Force) meant for deterrence. In June 1959, de Gaulle banned the stationing of foreign nuclear weapons on French soil, which caused the United States to transfer 200 military aircraft out of France. Henceforth, the 26th Tactical Reconnaissance Wing stationed in Toul-Rosières Air Base was relocated to Ramstein AB in Germany and the base returned to French control in 1967. Between 1950 and 1967, the US Air Force operated ten major bases in France. On February 13, 1960, France tested its first nuclear bomb, Gerboise Bleue. Though France showed solidarity with the rest of NATO during the Cuban missile crisis in 1962, de Gaulle continued his pursuit of an independent defence by also removing the Atlantic and Channel fleets of France from NATO command. In 1966 all French armed forces were removed from NATO’s integrated military command and all non-French NATO troops were asked to leave France. But the country remained in the political alliance. This withdrawal precipitated the relocation of the Supreme Headquarters Allied Powers Europe (SHAPE) from Paris to Casteau, north of Mons, Belgium, by 16 October 1967. France rejoined NATO's military command in 1993. The creation of NATO had as consequences the necessity for standardisation of military technology and unified strategy, through Command, Control and Communications centers (aka C4ISTAR). The STANAG (Standardisation Agreement) insured such coherence. Hence, the 7.62×51 NATO rifle cartridge was introduced in the 1950s as a standard firearm cartridge among NATO countries. Fabrique Nationale's FAL became the most popular 7.62 NATO rifle in Europe and served into the early 1980s. Also, aircraft marshalling signals were standardised, so that any NATO aircraft could land at any NATO base. 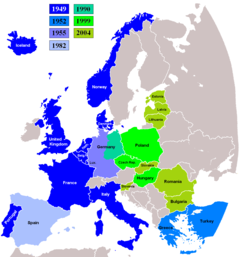 The membership of the organisation in this time period likewise remained largely static, with NATO only gaining one new member in 30 May 1982, when newly democratic Spain joined the alliance, following a referendum. Greece also in 1974 withdrew its forces from NATO’s military command structure, as a result of Greco-Turkish tensions following the 1974 Cyprus dispute; Greek forces were however readmitted in 1980, with Turkish cooperation. NATO was founded early in the Cold War with the express aim of defending western Europe against a military invasion by the Soviet Union. On 24 October 1990, Italian Prime minister Giulio Andreotti (member of the Christian Democracy, DC) publicly revealed the existence of Gladio, a clandestine paramilitary militia, known as " stay-behind armies", which had as official aim to carry on guerrilla warfare behind enemy lines in case of a successful Warsaw Pact invasion. Andreotti told the Italian Parliament that NATO had long held a covert policy of training partisans in the event of a Soviet Invasion of Western Europe. Spurred by the difficulties in setting up partisan organisation in occupied Europe during the Second World War, the CIA, British MI6 and NATO trained and armed partisan groups in NATO states to fight a guerrilla war if they were conquered in the event of a Warsaw Pact invasion. Operating in all of NATO and even in neutral countries (Austria, Finland - see also Operation Stella Polaris -, Sweden or Switzerland, one of the three state who had a parliamentary inquiry in the matter) or in Spain before its 1982 adhesion to NATO, Gladio was first coordinated by the Clandestine Committee of the Western Union (CCWU), founded in 1948. After the 1949 creation of NATO, the CCWU was integrated into the Clandestine Planning Committee (CPC), founded in 1951 and overseen by the SHAPE (Supreme Headquarters Allied Powers Europe), transferred to Belgium after France’s official retreat from NATO in 1966 — which was not followed by the dissolution of the French stay-behind paramilitary movements. According to historian Daniele Ganser, one of the major researcher on the field, "Next to the CPC, a second secret army command centre, labeled Allied Clandestine Committee (ACC), was set up in 1957 on the orders of NATO's Supreme Allied Commander in Europe (SACEUR). This military structure provided for significant US leverage over the secret stay-behind networks in Western Europe as the SACEUR, throughout NATO's history, has traditionally been a US General who reports to the Pentagon in Washington and is based in NATO's Supreme Headquarters Allied Powers Europe (SHAPE) in Mons, Belgium. The ACC's duties included elaborating on the directives of the network, developing its clandestine capability, and organizing bases in Britain and the United States. In wartime, it was to plan stay-behind operations in conjunction with SHAPE. According to former CIA director William Colby, it was 'a major program'." The existence of Gladio, one of the best kept secret during the Cold War, is now widely recognised. Belgium, Italy and Switzerland have held parliamentary inquiries in the matter. What remains controversial is the ties between Gladio members, of whom many belonged to neo-fascist movements, and false flag terrorist attacks. A NATO spokesman denied on 5 November 1990 any knowledge or involvement with Gladio and has since refused to comment. the US State Department has itself admitted the existence of Gladio, but denied it has been involved in terrorism, in particular in Italy and in Greece. In Italy in particular, Gladio paramilitary groups have been accused by the justice of having carried out dozens of terrorist bombings, which were officially blamed on leftist groups such as the Red Brigades. It has been alleged that these groups and the individuals in them were responsible for the strategy of tension in Italy which aimed at impeding the " historic compromise" between the Christian Democracy and the Italian Communist Party (PCI) (including the 1969 Piazza Fontana bombing and the Bologna massacre (1980)) political assassinations in Belgium, military coups in Greece (1967) and Turkey (1980) and an attempted coup in France (1961). The supposed aim of this group was to prevent Communist movements in Western Europe from gaining power. Some researchers have said that the true aim was to increase the power and control of the United States over Europe. In 2000, a report from the Italian Left Democrat party, "Gruppo Democratici di Sinistra l'Ulivo", concluded that the strategy of tension had been supported by the United States to "stop the PCI (Communist Party), and to a certain degree also the PSI, from reaching executive power in the country". A report, stated that "Those massacres, those bombs, those military actions had been organised or promoted or supported by men inside Italian state institutions and, as has been discovered more recently, by men linked to the structures of United States intelligence." The end of the Cold War and the dissolution of the Warsaw Pact in 1991 removed the de facto main adversary of NATO. This caused a strategic re-evaluation of NATO's purpose, nature and tasks. In practice this ended up entailing a gradual (and still ongoing) expansion of NATO to Eastern Europe, as well as the extension of its activities to areas that had not formerly been NATO concerns. The first post-Cold War expansion of NATO came with the reunification of Germany on 3 October 1990, when the former East Germany became part of the Federal Republic of Germany and the alliance. This had been agreed in the Two Plus Four Treaty earlier in the year. To secure Soviet approval of a united Germany remaining in NATO, it was agreed that foreign troops and nuclear weapons would not be stationed in the east, and also that NATO would never expand further east. On 28 February 1994, NATO also took its first military action, shooting down four Bosnian Serb aircraft violating a UN-mandated no-fly zone over central Bosnia and Herzegovina. Operation Deny Flight, the no-fly-zone enforcement mission, had began a year before, on 12 April 1993, and was to continue until 20 December 1995. NATO air strikes that year helped bring the war in Bosnia to an end, resulting in the Dayton Agreement. Between 1994 and 1997, wider forums for regional cooperation between NATO and its neighbours were set up, like the Partnership for Peace, the Mediterranean Dialogue initiative and the Euro-Atlantic Partnership Council. On 8 July 1997, three former communist countries, Hungary, the Czech Republic, and Poland, were invited to join NATO, which finally happened in 1999. On 24 March 1999, NATO saw its first broad-scale military engagement in the Kosovo War, where it waged an 11-week bombing campaign against what was then the Federal Republic of Yugoslavia. A formal declaration of war never took place. Yugoslavia referred to the Kosovo War as military aggression, as being undeclared and contravening the UN Charter. The conflict ended on 11 June 1999, when Yugoslavian leader Slobodan Milošević agreed to NATO’s demands by accepting UN resolution 1244. NATO then helped establish the KFOR, a NATO-led force under a United Nations mandate that operated the military mission in Kosovo. Debate concerning NATO's role and the concerns of the wider international community continued throughout its expanded military activities: The United States opposed efforts to require the UN Security Council to approve NATO military strikes, such as the ongoing action against Yugoslavia, while France and other NATO countries claimed the alliance needed UN approval. American officials said that this would undermine the authority of the alliance, and they noted that Russia and China would have exercised their Security Council vetoes to block the strike on Yugoslavia. In April 1999, at the Washington summit, a German proposal that NATO adopt a no-first-use nuclear strategy was rejected. The expansion of the activities and geographical reach of NATO grew even further as an outcome of the September 11 attacks. These caused as a response the provisional invocation (on September 12) of the collective security of NATO's charter — Article 5 which states that any attack on a member state will be considered an attack against the entire group of members. The invocation was confirmed on 4 October 2001 when NATO determined that the attacks were indeed eligible under the terms of the North Atlantic Treaty. The eight official actions taken by NATO in response to the attacks included the first two examples of military action taken in response to an invocation of Article 5: Operation Eagle Assist and Operation Active Endeavour. On the issue of Afghanistan on the other hand, the alliance showed greater unity: On 16 April 2003 NATO agreed to take command of the International Security Assistance Force (ISAF) in Afghanistan. The decision came at the request of Germany and the Netherlands, the two nations leading ISAF at the time of the agreement, and all 19 NATO ambassadors approved it unanimously. The handover of control to NATO took place on 11 August, and marked the first time in NATO’s history that it took charge of a mission outside the north Atlantic area. Canada had originally been slated to take over ISAF by itself on that date. In January 2004, NATO appointed Minister Hikmet Çetin, of Turkey, as the Senior Civilian Representative (SCR) in Afghanistan. Minister Cetin is primarily responsible for advancing the political-military aspects of the Alliance in Afghanistan. On 31 July 2006, a NATO-led force, made up mostly of troops from Canada, Great Britain, Turkey and the Netherlands, took over military operations in the south of Afghanistan from a U.S.-led anti-terrorism coalition. 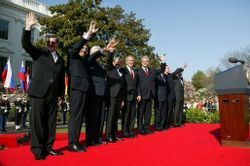 The NATO Secretary General, the U.S. President, and the Prime Ministers of Latvia, Slovenia, Lithuania, Slovakia, Romania, Bulgaria, and Estonia after a ceremony welcoming them into NATO on 29 March 2004. New NATO structures were also formed while old ones were abolished: The NATO Response Force (NRF) was launched at the 2002 Prague Summit on 21 November. On 19 June 2003, a major restructuring of the NATO military commands began as the Headquarters of the Supreme Allied Commander, Atlantic were abolished and a new command, Allied Command Transformation (ACT), was established in Norfolk, Virginia, USA, and the Supreme Headquarters Allied Powers Europe (SHAPE) became the Headquarters of Allied Command Operations (ACO). ACT is responsible for driving transformation (future capabilities) in NATO, whilst ACO is responsible for current operations. Membership went on expanding with the accession of seven more Northern European and Eastern European countries to NATO: Estonia, Latvia and Lithuania (see Baltic Air Policing) and also Slovenia, Slovakia, Bulgaria, and Romania. They were first invited to start talks of membership during the 2002 Prague Summit, and joined NATO on 29 March 2004. A number of other countries have also expressed a wish to join the alliance, including Albania, Croatia, the former Yugoslav Republic of Macedonia, Georgia and Montenegro. From the Russian point of view, NATO's eastward expansion since the end of the cold war has been in clear breach of an agreement between Soviet leader Mikhail Gorbachev and US President George H.W. Bush which allowed for a peaceful unification of Germany. NATO's expansion policy is seen as a continuation of a Cold War attempt to surround and isolate Russia. The 2006 NATO summit was held in Riga, Latvia, which had joined the Atlantic Alliance two years earlier. It is the first NATO summit in a former COMECON country. In August 2003, NATO commenced first mission ever outside Europe when it assumed control over International Security Assistance Force (ISAF) in Afghanistan. However, some critics feel that national caveats or other restrictions undermine the efficiency of ISAF. For instance, political scientist Joseph Nye stated in a 2006 article that "many NATO countries with troops in Afghanistan have "national caveats" that restrict how their troops may be used. While the Riga summit relaxed some of these caveats to allow assistance to allies in dire circumstances, Britain, Canada, the Netherlands, and the US are doing most of the fighting in southern Afghanistan, while French, German, and Italian troops are deployed in the quieter north. It is difficult to see how NATO can succeed in stabilizing Afghanistan unless it is willing to commit more troops and give commanders more flexibility." If these caveats were to be eliminated, it is argued that this could help NATO to succeed. April 4, 1949 France Founders France withdrew from the integrated military command in 1966. From then until 1993 it had remained solely a member of NATO's political structure. April 4, 1949 Iceland Founders Iceland, the sole member that does not have its own standing army (The Iceland Defense Force, the United States military contingent stationed in Iceland, was withdrawn September 2006), joined on the condition that they would not be expected to establish one. However, it has a Coast Guard and has recently provided troops trained in Norway for NATO peacekeeping. 18 February 1952 Greece First Greece withdrew its forces from NATO’s military command structure from 1974 to 1980 as a result of Greco-Turkish tensions following the 1974 Cyprus dispute. Note that this article poses two general limits to non-member states: (1) only European states are eligible for membership and (2) these states need the approval of all the existing member states. The second criterion means that every member state can put some criteria forward that have to be attained. 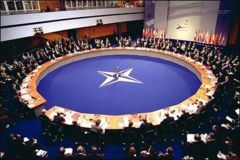 In practice, NATO formulates in most cases a common set of criteria, but for instance in the case of Cyprus, Turkey blocks Cyprus' wish to be able to apply for membership as long as the Cyprus dispute is not resolved. NATO provides feedback as well as technical advice to each country and evaluates its progress on an individual basis. NATO is also unlikely to invite countries such as the Republic of Ireland, Sweden, Finland, Austria and Switzerland, where popular opinion and the elected governments do not support NATO membership. NATO officially recognises the policy of neutrality practised in these countries, and does not consider the failure to set a goal for NATO membership as a sign of distrust. A 2003 opinion poll showed that about 60 percent of the Croatian citizens were in favour of NATO membership. Support for membership however has steadily declined since Western states and organizations (such as the NATO and the EU) demanded the arrest of the popular Croatian war general Ante Gotovina (until he was captured in 2005) and since the beginning of the Iraq War. A 2006 opinion poll showed that only 29% of the population still supported NATO membership. It is not yet known how Croatia will make the final decision about membership: through an act of parliament or via a binding referendum. If the latter is the case, the prospect of NATO membership is slim. Due to the lack of public support, the Croatian government, which considers NATO membership a top priority, is currently preparing a new strategy to promote the benefits of membership. The main contester of the presidency, Sauli Niinistö of the National Coalition Party, supported Finland joining a "more European" NATO. Fellow right-winger Henrik Lax of the Swedish People's Party likewise supported the concept. On the other side, incumbent president Tarja Halonen of the Social Democratic Party opposed changing the status quo, as did most other candidates in the election. Her victory and re-election to the post of president has currently put the issue of a NATO membership for Finland on hold for at least the duration of her term. In 1949 Sweden elected not to join NATO and declared a security policy which remains in effect today: non-alignment in peace, neutrality in war. This position was maintained without much discussion during the Cold War. Since the '90's however there has been an active debate in Sweden on the question of NATO membership in the post-Cold War world. While the government parties in Sweden have opposed membership, they have participated in NATO-led missions in Bosnia ( IFOR and SFOR), Kosovo ( KFOR) and Afghanistan ( ISAF). The Swedish Centre Party and Social Democratic party have remained in favour of neutrality. This view is shared by Green and Left parties in Sweden. The Moderate Party and the Liberal party lean toward NATO membership. These ideological cleavages were visible again in November 2006 when Sweden could either buy two new transport planes or join NATO's plane pool, and in December 2006, when Sweden was invited to join the NATO Response Force. A 2006 poll showed that the majority of Swedes remain opposed to joining NATO (46% are against, 22% are in favour, ±5% error margin). Ukraine Defence Minister Anatoliy Hrytsenko declared that Ukraine would have an Action Plan on NATO membership by the end of March 2006, to begin implementation by September 2006. A final decision concerning Ukraine's membership in NATO is expected to be made in 2008, with full membership possible by 2010. The idea of Ukrainian membership in NATO has gained support from a number of NATO leaders, including President Traian Băsescu of Romania and president Ivan Gašparovič of Slovakia. The Deputy Foreign Minister of Russia, Alexander Grushko, announced however that NATO membership for Ukraine was not in Russia's best interests and wouldn't help the relations of the two countries. Currently a majority of Ukrainian citizens oppose NATO membership, independently of their respective political views and beliefs. Protests have taken place by opposition blocs against the idea, and petitions signed urging the end of relations with NATO. Former Prime Minister Yuriy Yekhanurov has indicated Ukraine will not enter NATO as long as the public continues opposing the move. Plans for membership were shelved on 14 September 2006 due to the overwhelming disapproval of NATO membership. Currently the Ukrainian Government started an information campaign, aimed at informing the Ukrainian people about the consequences of membership. The likelihood of a referendum regarding membership is growing. A double framework has been established to help further co-operation between the 26 NATO members and 23 "partner countries". The Partnership for Peace (PfP) programme was established in 1994 and is based on individual bilateral relations between each partner country and NATO: each country may choose the extent of its participation. The PfP programme is considered the operational wing of the Euro-Atlantic Partnership. The Euro-Atlantic Partnership Council (EAPC) on the other hand was first established on 29 May 1997, and is a forum for regular coordination, consultation and dialogue between all 49 participants. Malta joined PfP in 1994, but its new government withdrew in 1996. Because of this Malta is not participating in ESDP activities that use NATO assets and information. Cyprus's admission to PfP is resisted by Turkey, because of the Northern Cyprus issue. Because of this Cyprus is not participating in ESDP activities that use NATO assets and information. Intensified Dialogue with NATO is viewed as a stage before being invited to enter the alliance Membership Action Plan (MAP), while the latter should eventually lead to NATO membership. On 16 October 2006, NATO and Israel finalised the first ever Individual Cooperation Programme (ICP) under the enhanced Mediterranean Dialogue, where Israel will be contributing to the NATO maritime Operation Active Endeavour. The ICP covers many areas of common interest, such as the fight against terrorism and joint military exercises in the Mediterranean Sea. In April 2005, Australia, which had been appointed a US Major non-NATO ally (MNA) in 1999, signed a security agreement with NATO on enhancing intelligence co-operation in the fight against terrorism. Australia also posted a defence attache to NATO's headquarters. Cooperation with Japan (MNA, 1989), El Salvador, South Korea (MNA, 1989) and New Zealand (MNA, 1996) was also announced as priority. Israel (MNA, 1989) is currently a Mediterranean Dialogue country and has been recently seeking to expand its relationship with NATO. The first visit by a head of NATO to Israel occurred on 23 February - 24 February 2005 and the first joint Israel-NATO naval exercise occurred on 27 March 2005. In May of the same year Israel was admitted to the NATO Parliamentary Assembly. Israeli troops also took part in NATO exercises in June 2005. There have been advocates for the NATO membership of Israel, amongst them the former Prime Minister of Spain José María Aznar and Italian Defence Minister Antonio Martino. However Secretary-General of the organisation Jaap de Hoop Scheffer has dismissed such calls, saying that membership for Israel is not on the table. Martino himself said that a membership process could only come after an Israeli request; such a request has not taken place. Israeli Foreign Minister Silvan Shalom stated in February 2005 that his country was looking to upgrade its relationship with NATO from a dialogue to a partnership, but that it was not seeking membership, saying that "NATO members are committed to mutual defence and we don't think we are in a position where we can intervene in other struggles in the world", and also that "We don't see that NATO should get engaged in our conflict here in the Middle East." The second pivotal member of each country's delegation is the Military Representative, a senior officer from each country's armed forces. Together the Military Representatives form the Military Committee, a body responsible for recommending to NATO’s political authorities those measures considered necessary for the common defence of the NATO area. Its principal role is to provide direction and advice on military policy and strategy. It provides guidance on military matters to the NATO Strategic Commanders, whose representatives attend its meetings, and is responsible for the overall conduct of the military affairs of the Alliance under the authority of the Council. Like the council, from time to time the Military Committee also meets at a higher level, namely at the level of Chiefs of defence, the most senior military officer in each nation's armed forces. The NATO Parliamentary Assembly, presided by Pierre Lellouche, is made up of legislators from the member countries of the North Atlantic Alliance as well as 13 associate members. It is however officially a different structure from NATO, and has as aim to join together deputies of NATO countries in order to discuss security policies. The commander of Allied Command Operations retained the title "Supreme Allied Commander Europe (SACEUR)", and is based in the Supreme Headquarters Allied Powers Europe ( SHAPE) located at Casteau, north of the Belgian city of Mons. This is about 80 km (50 miles) south of NATO’s political headquarters in Brussels. Allied Command Transformation (ACT) is based in the former Allied Command Atlantic headquarters in Norfolk, Virginia, USA. Map Of Major USAF bases in France before Charles de Gaulle's 1966 withdrawal from NATO military integrated command. The NATO structure is divided into two commands, one for operations and one for transformation. Allied Command Operations (ACO), on one hand, is based at SHAPE (Supreme Headquarters Allied Powers Europe), located at Casteau, north of Mons in Belgium. The ACO is headed by SACEUR, a U.S. four star general with the dual-hatted role of heading U.S. European Command, which is headquartered in Stuttgart, Germany. SHAPE was in Paris until 1966, when French president Charles de Gaulle withdrew French forces from the Atlantic Alliance. NATO's headquarters were then forced to move to Belgium, while many military units had to move. During a large-scale relocation plan, Operation Freloc, USAFE presence in the UK greatly increased. On the other hand, Allied Command Transformation (ACT) is located in Norfolk, Virginia, at the former headquarters of SACLANT (Supreme Allied Commander Atlantic, decommissionned in 2003) and headed by the Supreme Allied Commander Transformation (SACT), a U.S. flag (four star) admiral with the dual-hatted role as commander U.S. Joint Forces Command (COMUSJFCOM). It the ACT is co-located in the United States Joint Forces Command in Norfolk, Virginia, there is also an ACT command element located at SHAPE in Mons, Belgium. Additional command elements include the Joint Warfare Centre (JWC) located in Stavanger, Norway (in the same site as the Norwegian NJHQ); the Joint Force Training Centre (JFTC) in Bydgoszcz, Poland; the Joint Analysis and Lessons Learned Centre (JALLC) in Monsanto, Portugal; and the NATO Undersea Research Centre (NURC), La Spezia, Italy. These additional elements assist in ACT's transformation efforts. Under a customer-funded arrangement, ACT invests about 30 million Euros into research with the NATO Consultation, Command and Control Agency ( NC3A) each year to support scientific and experimental programs. The existence and ownership, or simple use via leasing, of military bases is subject to domestic and international changes in political context. Some bases used by allied countries members of NATO are not NATO bases, but may be national or joint bases. The US have bases scattered all over the world, which may sometimes be used by allies (i.e. Spanish Morón Air Base was used by NATO during the 1999 Kosovo War). Since the end of the Cold War, the US have closed many bases, implementing Base Realignment and Closure plans, the lattest being the 2005 plan. However, others bases are opened, and readjustments always occurring (i.e. transfer of planes from the Spanish Torrejon Air Base to the Italian Aviano Air Base, etc.). Beginning in 1953 USAFE (US Air Forces in Europe) DOBs (NATO Dispersed Operating Bases) were constructed in France and were completed in about two years. Each was built to a standard NATO design of a 7,900' runway. Four DOBs were built for USAFE use. They were designed to have the capability to base about 30 aircraft, along with a few permanent buildings serviced with utilities and space for a tent city to house personnel. 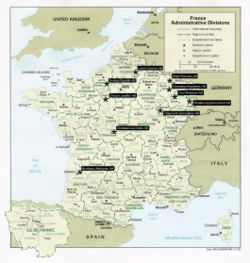 Between 1950 and 1967, when all NATO forces had to withdraw from France, the USAFE operated ten major air bases in France. The USAFE (United States Air Forces in Europe)'s headquarters are located in Ramstein Air Base (West Germany), after having been relocated from Wiesbaden Army Airfield in 1973. The Sembach Air Base, used by NATO during the Cold War, was returned to German control and became an annex of Rammstein Air Base in 1995. Germany also hosts the Campbell Barracks in Heidelberg, Germany, which is the location of the Headquarters of the US Army in Europe and Seventh Army (HQ USAREUR, /7A, as well as V Corps and the headquarters of NATO’s Allied Land Forces Central Europe ( LANDCENT). The Kaiserslautern Military Community is the largest US military community outside of the US, while the Landstuhl Regional Medical Centre is the largest US military hospital oversea, treating wounded soldiers from Iraq or Afghanistan. Furthermore, Patch Barracks is home to the US European Command (EUCOM) and is the headquarters for US armed forces in Europe. It is also the centre for the Special Operations Command, Europe (SOCEUR), which commands all US special forces units in Europe. 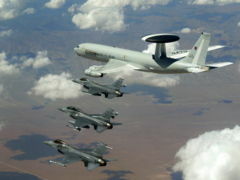 NATO also operates a fleet of E-3A Sentry AWACS airborne radar aircraft based at Geilenkirchen Air Base in Germany, and is establishing the NATO Strategic Airlift Capability through the planned purchase of a number of C-17s. Torrejon Air Base, near Madrid in Spain, was the headquarters of the United States Air Forces in Europe (USAFE) Sixteenth Air Force as well as the 401st Tactical Fighter Wing. However, under popular discontent in particular from the PSOE and the PCE, an agreement was reached in 1988 to reduce US military presence in Spain. Henceforth, aircraft (mostly F-16) based at Torrejon were rotated to other USAFE airbases at Aviano Air Base, Italy, and at Incirlik AB, Turkey. Torrejon was, in addition, a staging, reinforcement, and logistical airlift base. The USAFE completely withdrew its forces on 21 May 1992. As of 2007, Zaragossa is expected to host the new Alliance Ground Surveillance (AGS) system of NATO, produced by the Transatlantic Industrial Proposed Solution (TIPS) consortium with the goal of having an initial operational capability in 2010. As in Italy, this has been met with some opposition from various anti-militarist sectors of Spanish society. The SHAPE Technical Centre (STC) in The Hague (Netherlands) merged in 1996 with the NATO Communications and Information Systems Agency (NACISA) based in Brussels (Belgium), forming the NATO Consultation, Command and Control Agency (NC3A). The agency comprises around 650 staff, of which around 400 are located in The Hague and 250 in Brussels. It reports to the NATO Consultation, Command and Control Board (NC3B). NATO's Joint Force Command Brunssum (Netherlands) houses members of the central European NATO countries, but includes the US armed forces, Canadian forces, British, German, Belgian and Dutch personnel. In the Portuguese territory of the Azores, the Lajes Field provides support to 3,000 aircraft including fighters from the US and 20 other allied nations each year. The geographic position has made this airbase strategically important to both American and NATO's warfighting capability. Beginning in 1997, large fighter aircraft movements called Air Expeditionary Forces filled the Lajes flightline. Lajes also has hosted B-52 and B-1 bomber aircraft on global air missions. Lajes also supports many routine NATO exercises, such as the biennial Northern Viking exercise. In Netherlands the Soesterberg Air Base, used by the USAFE, was closed after the Cold War, and the 298 and 300 300 Squadron are to be moved to Gilze-Rijen Air Base. The Leeuwarden Air Base is the home of the annual NATO exercice "Frisian Flag". US Secretary of State Condoleezza Rice has signed the Defense Cooperation Agreement with Sofia (Bulgaria), a new NATO member, in 2006. The treaty allows the US (not NATO) to develop as joint US-Bulgarian facilities the Bulgarian air bases at Bezmer (near Yambol) and Graf Ignatievo (near Plovdiv), the Novo Selo training range (near Sliven), and a logistics centre in Aytos, as well as to use the commercial port of Burgas. At least 2,500 US personnel will be located there. The treaty also allows the US to use the bases "for missions in tiers country without a specific authorization from Bulgarian authorities," and grants US militaries immunity from prosecution in this country. Another agreement with Romania permits the US to use the Mihail Kogălniceanu base and another one nearby. Various military bases are used in Turkey, including the Incirlik Air Base, near Adana, and İzmir Air Base. The US 39th Air Base Wing, located at Incirlik since 1966, recently took part in Operation Northern Watch, a US European Command Combined Task Force (CTF) charged with enforcing its own no-fly zone above the 36th parallel in Iraq, which started in January 1997. It also took part in the 2001 invasion of Aghanistan and in the 2003 invasion of Iraq. In Kosovo, Camp Bondsteel serves as the NATO headquarters for KFOR's Multinational Task Force East (MNTF-E). Camp Monteith has also been used by the KFOR. Camp Arifjan, a US Army base in Kuweit, has hosted various soldiers from allied countries. Manas Air Base in Kyrgyzstan, owned by the US Air Force, has also been used by the French Air Force and the Royal Australian Air Force during (non-NATO) Operation Enduring Freedom in Afghanistan. Although NATO was not initially engaged in Afghanistan, it has since deployed the ISAF force, which took control of the country in October 2006. Kyrgyz President Kurmanbek Bakiyev, who succeeded to Askar Akayev after the 2005 Tulip Revolution, threatened in April 2006 to expel U.S. troops from the base if the United States didn't agree by June 1 to pay more for stationing forces in the Central Asian nation. However, he finally withdrew this threat, but the U.S. and Kyrgyzstan have yet to agree to new terms for the military base. Beside the US and NATO, others global powers such as Russia and China are trying to acquire bases in Central Asia, in a struggle dubbed the " New Great Game." Thus, President of Uzbekistan Islom Karimov ordered the US to leave the Karshi-Khanabad which was vacated in January 2006. In Djibouti, NATO owns no bases, but both France and the US (since 2002) are present, with the 13th Foreign Legion Demi-Brigade sharing Camp Lemonier with the Combined Joint Task Force Horn of Africa (CJTF-HOA) of the United States Central Command. It is from Djibouti that Abu Ali al-Harithi, suspected mastermind of the 2000 USS Cole bombing, and US citizen Ahmed Hijazi, along with four others persons, were assassinated in 2002 while riding a car in Yemen, by a Hellfire missile sent by a RQ-1 Predator drone actionned from CIA headquarters in Langley, Virginia. It is also from there that the US Army launched attacks in 2007 against Islamic forces in Somalia. As NATO does not share a common intelligence interception system, each country develops its installations on its own. However, English-speaking countries members of the UKUSA Community have joined in the ECHELON program, which has bases scattered around the world. France allegedly has developed its own interception system, nicknamed " Frenchelon," as did Switzerland with the Onyx interception system (which recently gave the proof of the existence of CIA-operated black sites in Europe). NATO ACCS Management Agency (NACMA), based in Brussels, manages around a hundred persons in charge of the Air Control and Command System (ACCS) due for 2009.